The maximum temperature on Monday was 32.0ºC (89.6ºF) and the minimum 23.6ºC (74.5ºF). The maximum relative humidity was 98 per cent and the minimum 59 per cent. 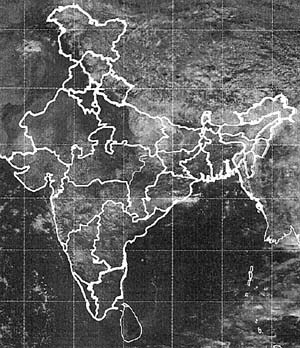 Rainfall: Rain or thundershowers have occurred at many places in east Uttar Pradesh, at a few places in Himachal Pradesh, Punjab, east Rajasthan, west Uttar Pradesh and Uttaranchal and at isolated places in Haryana and Jammu and Kashmir. Weather was dry in west Rajasthan. The chief amounts of rainfall in cm are : Delhi Bridge 13, Delhi Ridge and New Delhi (Safdarjung) 4 each, Himachal Pradesh: Guler 6, Sujanpur Tira 5, Nadaun 3, Nagrotasurian 2 and Ghamroor 1, Jammu and Kashmir: Jammu and Katra 2 each, Punjab: Ludhiana 6, Samrala 3 and Nangal and Nawanshahr 1 each, east Rajasthan: Pahadi and Talshai 2 each and Bharatpur, Tijara and Urmilasagar 1 each, east Uttar Pradesh: Regoli 17, Khadda 13, Gorakhpur 12, Birdghat 10, Balrampur 8, Ayodhya, Mukhlispur and Turtipar 7 each, Palliakalan 4, Chandradeepghat and Jaunpur 3 each, Basti, Bansi, Bani and Hardoi 2 each and Bahraich, Dalmau, Etawah and Sultanpur 1 each, west Uttar Pradesh: Dabri and Moradabad 1 each and Uttaranchal: Haripur 3 and Dehra Dun and Mukteshwar 1 each. Forecast valid until the morning of September 5: Rain or thundershowers will occur at many places in east Uttar Pradesh, at a few places in Himachal Pradesh and Uttaranchal and at isolated places in Haryana, Jammu and Kashmir, Punjab, east Rajasthan and west Uttar Pradesh. Weather will be mainly dry in west Rajasthan. Heavy rainfall warning: Heavy rain is likely at isolated places in east Uttar Pradesh during the next 24 hours. Forecast for Delhi and neighbourhood valid until the morning of September 5: Partly cloudy sky with the possibility of thundery development in some areas. Farmers weather bulletin for Delhi: Forecast valid until the morning of September 5: Development of thunderclouds is likely at a few places.